The unit is housed in a die cast metal case, with sliding side windows providing access to the measuring pan suspended from above. Above and behind this chamber is housed the balance mechanism. The digital readout and dials used to operate the apparatus are attached to the front console. It is estimated that weights and balances have existed for the purposes of barter and exchange from at least 3000 BC. Based on these most ancient concepts of balance, this unit employs some twentieth century innovation in creating a convenient and accurate weight measuring device. 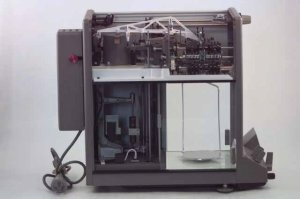 The H10Tw was produced for laboratory applications by the Swiss balance manufacturer Mettler. This style of mechanical balance was regarded as the standard device for laboratory measurements during the 1970s and 80s. The balance consists of a beam, one end of which supports the pan and adjustable weights and the other which supports the counterpoise weight (equal in mass to the pan plus the adjustable weights). The in-built adjustable concentric ring weights are mechanically arranged using dials on the front console. After placing the object of interest on the pan, equilibrium over a synthetic sapphire knife edge is broadly reached by removing the appropriate ring masses above the pan. The small deviation from equilibrium is then measured on an engraved optical scale placed in a reticle appended to the end of the lever. Light incident on the scale travels through a series of lenses and mirrors to be projected onto the rear of the front console. Ultimately, the balance measures to a precision of 0.05 mg over a range from zero to 160 grams. The H10Tw also features symmetrical air damping, an in-built taring facility and zero point and sensitivity adjustments. Purchased for A$435 around 1970, the balance found routine laboratory application in The University of Queensland Pathology Department, being donated to the Physics Museum in 1996. J.T. Stock (1969) Development of the Chemical Balance, HMSO.